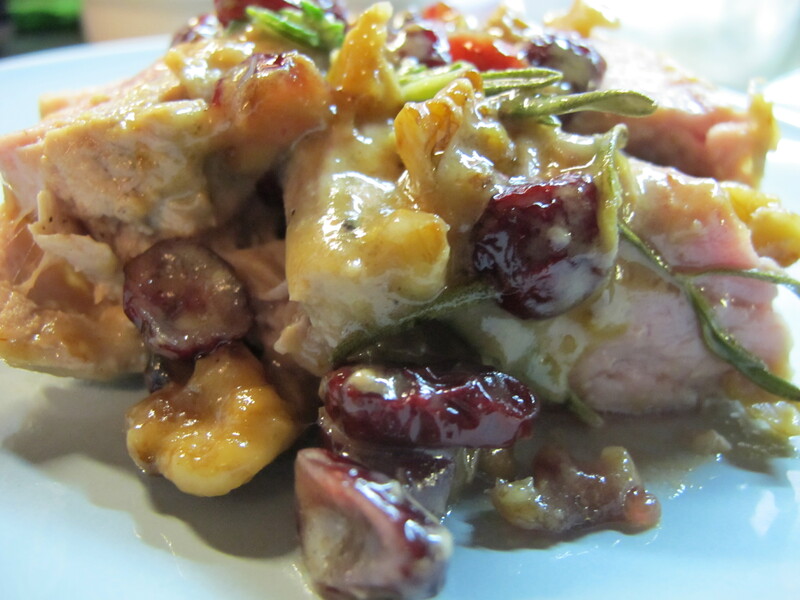 Pork Tenderloin with cranberries and goat cheese! Well honestly, I’ve outdone myself tonight! This recipe is a keeper! 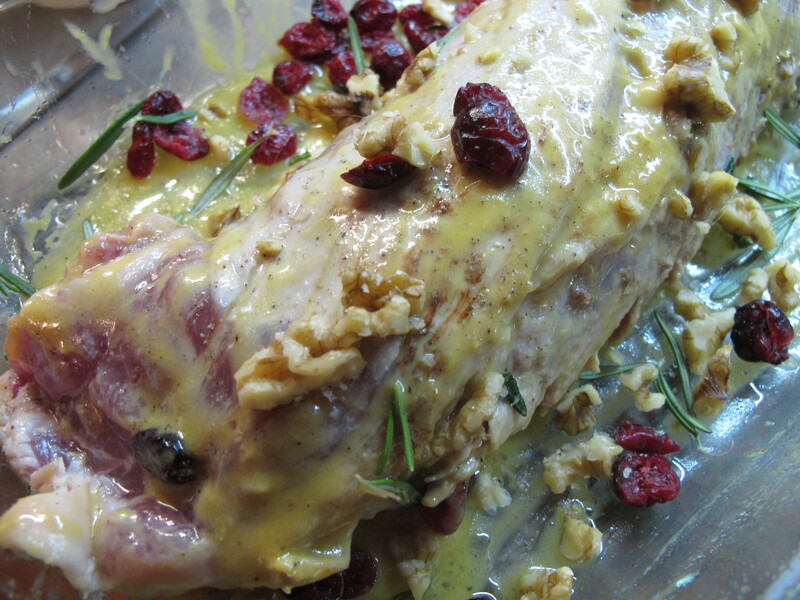 The Dijon mustard, the cranberries and the Rosemary blended perfectly. And what can I say about the walnuts? A last-minute inspiration that brought this meal to a whole other level (I felt like a true gourmet tonight!). The contrast between the crunchy walnuts and the tender pork was DIVIIIIIIIIINE! And the cheesy sauce mixed with some maple syrup sweetness, ohhhhhhhhhh Lordy Lordy Lord! Look how gooey the sauce was! Oddly, the walnuts in this picture look like corn, oh well! I can’t say that I often cook pork but I think that I’m starting to get the hang of it. The secret: never overcook it! Pork must be rosé, tender, unlike the hard overcooked garlic pork roasts that we were raised on…I love you Grandma but…. What’s sooooo great about cooking is, the more you cook, the better you get and the more you know which ingredients go well together. ENTER IMPROVISING and a whole new world of opportunities comes your way! For example, this recipe was originally pork, cranberries and goat cheese. I added the garlic, the Rosemary, the Dijon mustard, the walnuts and the maple syrup. I’m sure the original recipe was tasty but it seemed a bit dry (this is where the maple syrup popped into my head…). By the pace at which my hubby was eating, and all of the ooh’s and ahhhh’s that were oozing out of his half full mouth, I could assess that this recipe was a success! Oh, and did I say that it only took me 45 minutes (cooking time included). Cut your goat cheese into slices (3-5). Put them in a bowl with the cranberries, the sliced garlic clove and the Rosemary. Prepare your sauce: mix the Dijon mustard and the maple syrup in a small bowl. In a frying pad heat up some canola oil. Add a clove of garlic and cook to perfume the oil (2 minutes). Remove the clove and add the pork. Cut the pork in 2 and daub the middle with some sauce. Add the cheese, the cranberries, the rosemary and the garlic. Close the tenderloin.